Alpinestars GP Pro auto racing suit is back for 2016! 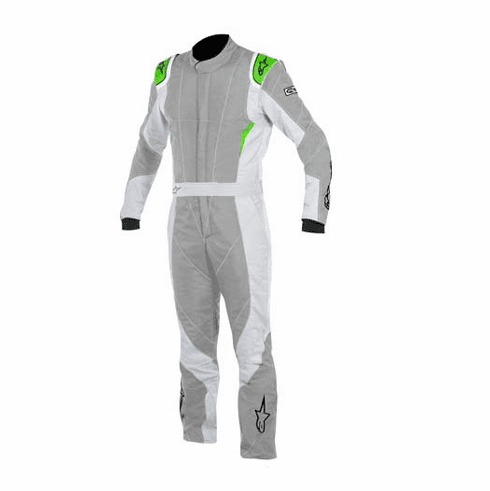 The Alpinestars GP Pro suit is Astars mid-range level suit borrowing from years of experience in professional motorsports. The Alpinestars GP Pro suit incorporates a new assembly method of construction for improved levels of breathability and comfort. The anatomically optimized, multi-layer GP Pro suit features advanced safety materials which offer highly effective heat transfer protection. Strategically placed anatomical stretch panels in the lower back, sides, and the crotch area offer the GP Pro suit user greater flexibility and superior fit without any weight penalties. Certified to the current SFI and FIA homologation standards, the GP Pro uses a 100% Nomex outer and middle layers with an Aramidic fiber inner liner to further shave weight and improve heat-resistance. The Alpinestars GP Pro suit has an engineered torso shape for an athletic fit with pre-shaped arm and legs for optimal fit in the driving position. The shoulder construction of the suit features additional padding for the HANS device, epaulette facility for driver extraction, and ending in fully floating gusseted arms for freedom of arm and shoulder movement. The Alpinestars GP Pro is designed to be a close-fitting suit with internal flat seams, adjustable collar, and belted waist for a precise fit. New for 2016, the GP Pro now features and comes only with boot-cut NASCAR style legs. FIA 8856-2000 and SFI 3.2/5 Approved.